This week we have started to try a new idea of getting Blake to start trying new foods. 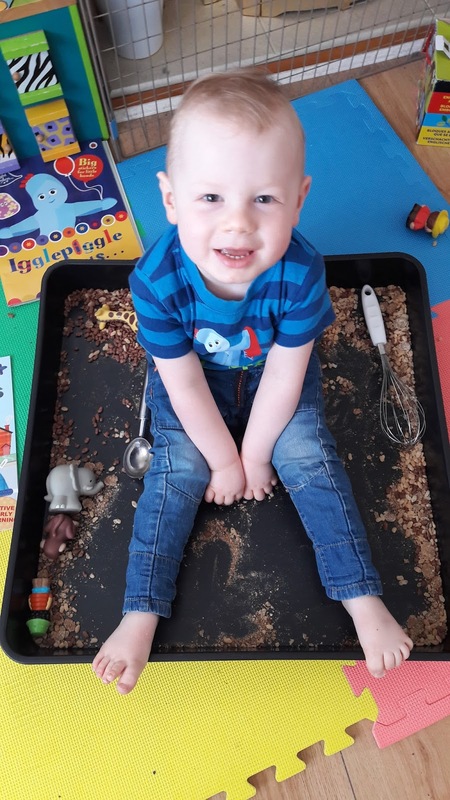 We are now starting to do more messy play but with food in hope he will start to eventually try new things. So this weeks photo is of him playing with some cereal that we needed to use up. He really loved it and was scooping and stirring as well as getting his zoo animals to stomp around. I'm also planning on doing messy play with jelly, porridge and cooked pasta over the coming weeks. Blake's been fussy with food since he turned a year old and very particular about what he eats. At 2 and a half he is still really fussy and we are finding it such hard work. We are even having issues with getting him to drink milk from a cup.